We've had a busy Christmas Eve. We started the day having brunch with Mickey's parents and sister. After eating we got to the present opening. The kids were going nuts with anticipation. Later Mickey pulled out a family gift for us to play with, DDR for the Wii. (That's Dance Dance Revolution for anyone who doesn't know what DDR stands for.) I think everyone had a good time dancing. After they left Kade and I laid down. I'm the only one who slept. Then we had dinner with my big family at my parents' house, Hawaiian Haystacks. (We always have something non-traditional.) And of course there were more presents to open. The kids were wild about the presents there too. They kept snooping and trying to figure out what things were. We couldn't stay too long because poor Mickey was having a bad allergic reaction to the dog. We came home and gave the kids their traditional Christmas Eve present, pajamas. This year I threw in slippers too. We then reenacted the Christmas story with our Little People nativity set and sang a few hymns before sending them to bed. I have a lot of pictures to go through before I put any on Flickr. 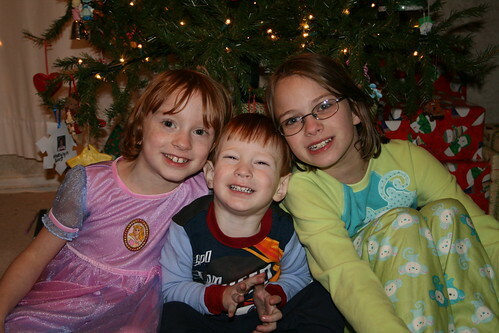 But here's a cute one of the kids in their new jammies. Merry Christmas. How cute are they? It was a busy day, but it was nice to spend it with family. Merry Christmas everyone!